Hello to all! This week we will be hosting three Women Build groups! * We are excited to host teams from Berkshire Bank, General Dynamics, and Lenox Yoga. These three teams will help us to finish the floor and raise the walls! 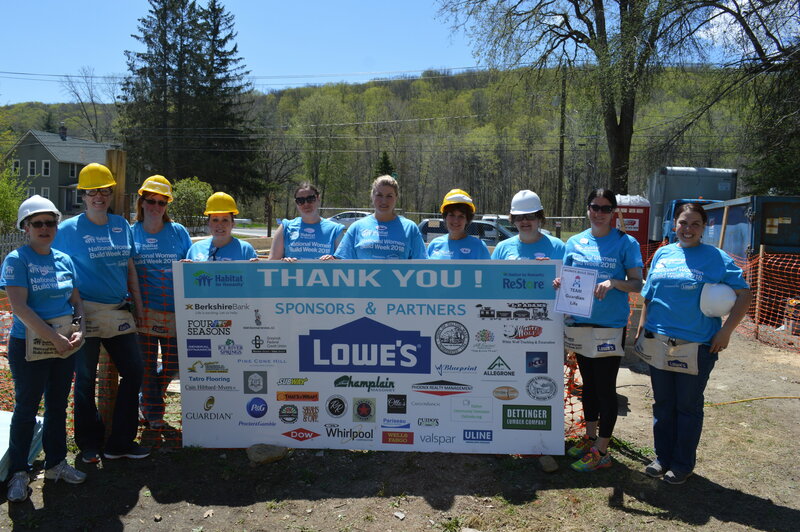 As each Women Build day begins and ends, we see our Women Build teams, core volunteers, and Habitat staff bringing us ever closer to creating a beautiful, safe, and stable home for Courtney and her children. We are so grateful for the commitment and energy that has already been put into this project and we are eager to see the community grow as we all watch this home come into being. Last week we hosted groups from Guardian Life Insurance, Greylock Federal Credit Union, and Miss Hall's School. 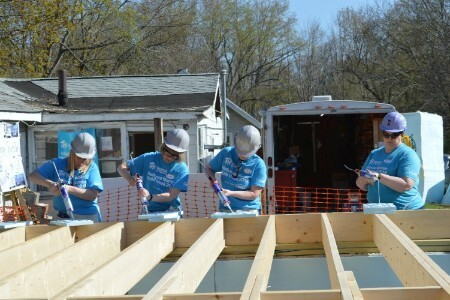 These three teams finished setting the posts, carried beam for the first floor, installed floor joists, installed subfloor, insulated and caulked the mud sill, and cut stair stringers alongside our amazing crew of regular volunteers and Habitat staff. It has been rewarding to see how quickly and efficiently we are able to build a safe and affordable home when our community works towards a common goal. Thank you to those teams who have contributed on site, in meetings, and financially as we all work to create a world where everyone has a decent place to live. 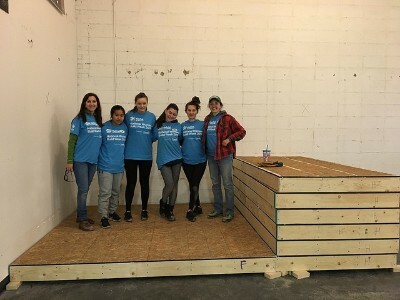 Now that our amazing crews of Women Builders, core volunteers, and Habitat staff have set floor joists, installed the subfloor, and carried beam for the first floor , (just to name a few tasks), we are now ready to move towards walls. We have the first floor deck set and will soon be framing walls and getting ready to frame the second floor. We are expecting to see a second floor in place by the end of the day on Saturday! "This progress would not be possible if not for our spectacular core volunteers, day leaders and women builders—not to mention an excellent office support staff that feeds us through our restaurant partners, gets us our materials and tools, and a Restore that generates revenue for it all. Thanks, everyone". Proper preparations for perspiration prevention! This week we are learning about the best ways to clean and maintain fans and air conditioners. In the beginning of the warmer season, it is important to clean fan blades and air conditioning filters before using these tools. This will help to prevent excess dust, allergies, and irritation. To learn more air conditioning facts, tune in next week for another installment of our "Four Fun Facts" segment.